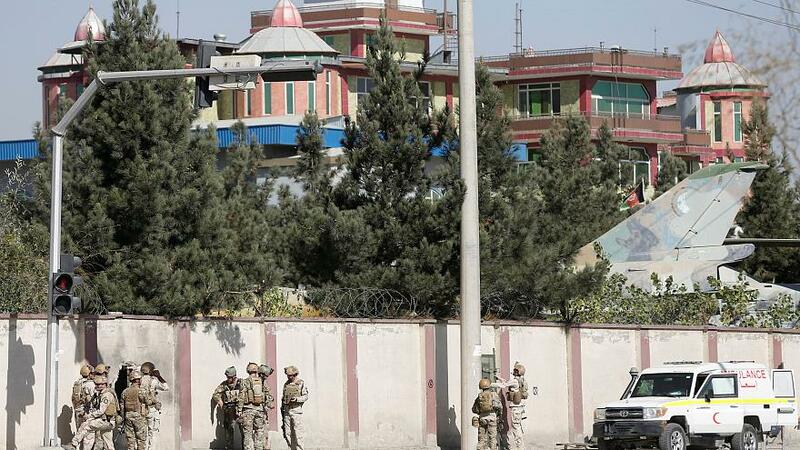 Gunmen disguised as police have killed a security guard and opened fire on staff at a private television station in the Afghan capital Kabul. The militant group that calls itself Islamic State has claimed responsibility for the attack on Shamshad TV – a Pashto-language broadcaster. After a sporadic gun battle lasting about two hours, Afghan special forces suppressed the attackers. Police said at least two people were killed and 20 wounded. “People dressed in police clothes came in and initially threw hand grenades, which killed one of our guards and wounded another,” Abed Ehsas, Shamshad’s news director told broadcaster Tolo News TV. Some two hours later the station, which had replaced regular programs with a still picture as the fighting went on, resumed normal service, its newsreader appearing with a bandage on a hand injured in the attack.. The attack, which underlined insecurity in Kabul, came on the day NATO announced an increase of some 3,000 troops in its Resolute Support mission in Afghanistan as part of a bid to break the stalemate with Taliban insurgents. Amid the crack of gunfire, a special forces unit blasted a hole in the concrete wall around the compound and entered the site as police blocked off surrounding streets. At least one attacker was killed during the operation, while another died at the compound entrance. In a statement on its news agency Amaq, ISIL claimed responsibility, without giving evidence. The group, based mainly in the eastern province of Nangarhar, has claimed a number of attacks on civilian targets in Kabul but uncertainty remains over whether all the attacks the group claims are actually its work. Shortly after the beginning of the attack, the Taliban’s main spokesman, Zabihullah Mujahid, issued an immediate denial of involvement. Suicide bombings are part of life in Kabul but the latest attack on journalists and media workers was described by human rights group Amnesty International as an “horrific crime”.